Combine warm water, yeast, salt and flour in a large mixing bowl and stir. The result will be a sticky, rough dough. If using a stand mixer, beat at medium speed or about a minute. Otherwise just use a spoon to stir until well combined. Lift the dough out and lightly grease the bowl with nonstick spray or olive oil. Cover and let rise in the refrigerator for two hours. Alternatively, let rise for 2 hours at room temperature and 2 hours in the fridge. Once risen, lightly sprinkle the dough with flour and transfer to a floured work surface. Knead a few times and then add pumpkin seeds, almonds and raisins. Knead until just combined, trying to keep the add-ins on the inside of the loaf, or else they'll get too crisp while baking. Place on parchment-lined baking stone or lightly greased baking sheet. Sift a light coating of flour over the top; to help keep the dough moist. Let rest for 45-60 minutes. Preheat oven to 230 C (450 F) while the dough rests. Place a metal or cast iron pan (not glass, Pyrex, or ceramic) on the lowest oven rack, and have 2 dl (1 cup) of hot water ready. When ready to bake, slash the bread 2 or 3 times with a knife, making a cut about 1 cm (½ inch) deep. Place bread in oven and carefully pour hot water into the shallow pan on the rack beneath. Expect it to bubble and steam; then close over door quickly. Bake the bread for 25 to 35 minutes, or until deep, golden brown. Remove the bread from the oven and cool on a rack. Store leftovers in a plastic bag at room temperature. Heat a panini machine or a ridged grill pan over medium heat. Brush the bread slices on both sides liberally with olive oil, then layer the brie on the insides of the bread. Sprinkle with a little salt and pepper. Divide the pear slices amongst the bread, and top one side of each sandwich with arugula. Fold the sandwiches together and place in the panini machine or on top of the preheated ridged grill pan with a heavy skillet (such as cast iron, or a skillet with a can in it) on top. Lower the heat to medium-low and cook the sandwich until the brie is fully melted and the bread is golden, 3-5 minutes per side. Serve immediatly while the cheese is still warm. Mix together the quick cooking oats, light brown sugar, baking powder, kosher salt and ground cinnamon. Add in the vanilla extract, milk and egg. Mix the ingredients together. Then add in the mashed banana and peanut butter. Combine all of the ingredients. Pour the mixture into a lightly greased 20x20 cm (8 by 8 inch) metal baking pan. Bake at 175 C (350 F) for 20 minutes. Cut into squares and enjoy! Don't have time to bake bread first thing you do when you get up in the morning? How about just having to turn on the oven, then? I think most people have time for that, and it's a smart way to get fresh bread in the morning. Obviously, you need to prepare the dough as usual but in this case, the night before. 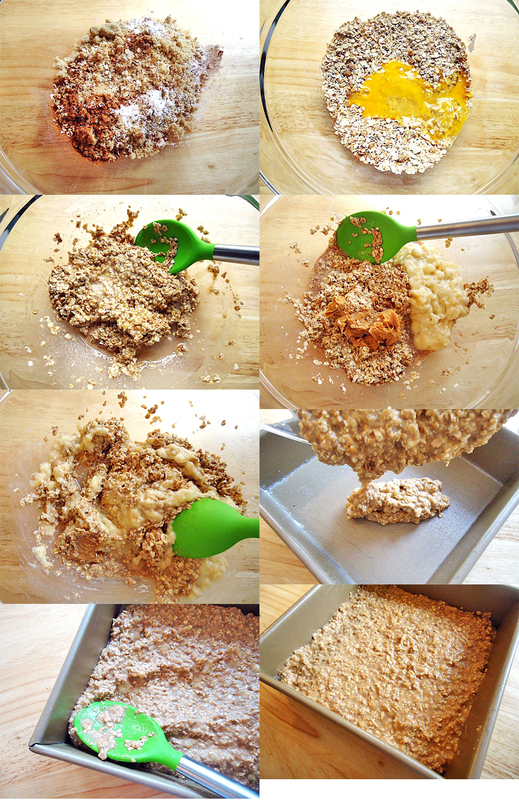 Crumble the yeast into a bowl and mix it with the water. Peel and dice the apple into small cubes, chop the nuts and place them together with the apple cubes in the dough liquid. Add the remaining ingredients and knead for 10 minutes. Divide the dough into equal pieces, shape into small buns and place on a baking sheet lined with parchment paper, cover with plastic wrap and place in the fridge overnight for 10-12 hours. When you wake up, take the plate out of the fridge and take off the foil, then let the bread stand at room temperature for about 30-40 minutes while the oven heats. 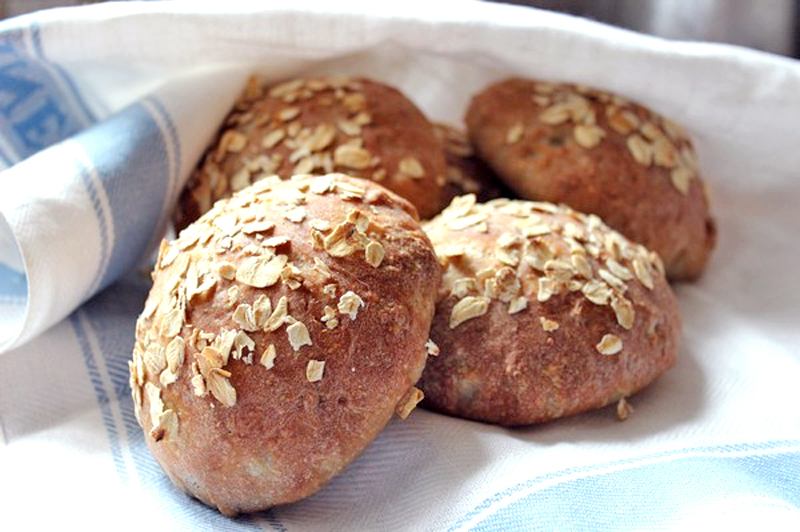 Brush with water and sprinkle some rolled oats over before they are baked at 225 C (440 F) for 15 minutes.